Originally released in 1959 as part of a series of conceptual space vehicles, Monogram used the designs and ideas of one of America's foremost authorities on space travel, Willey Ley. Included in the series of kits were a TV orbiter, an orbital rocket and Passenger rocket. Most of these kits have also been reissued, much to the delight of a number of baby-boomers who built the original kits back when they were grade school kids! 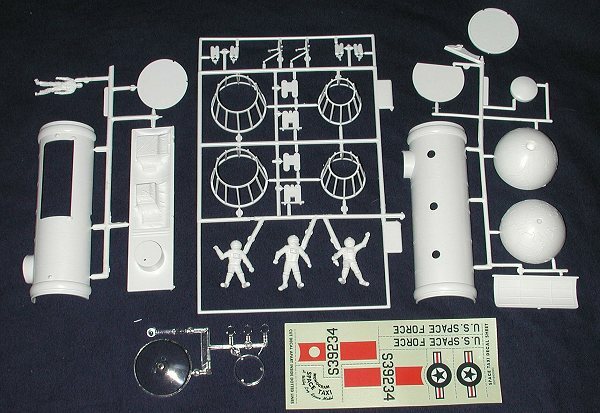 Because the subject material was quickly overcome by events, spacecraft of the 50's were not seen as items that could hold up over the long run so these kits were never reissued. That is until the mid-1990s. Revell-Monogram saw a market emerging as older baby-boomers were reaching middle age and wanted a taste of their youth. Today's kids, for the most part, have little interest in plastic models, but for those of us in their 40s and 50s, models were a part of growing up. The Space Taxi is probably the least desirable of the series as witnessed by the number still on the shelves of the local hobby shop. No scale is given, but it appears to be around 1/48 judging by the size of the figures included. The space taxi itself was to be a general purpose cargo, passenger vehicle used for short range transport. There was a cargo container that contained the standing pilot and space in a fore and aft cage for suited passengers. In this same caged area were the two thruster rockets. No side maneuvering thrusters are shown so moving this thing around would have been quite a challenge, to say the least. The kit itself is very well molded and nearly flash free, probably because of relatively low usage of the molds! Detail is raised lines and rivets as one would expect of a 50's kit, but very well done. Included in the kit are four figures. One for the pilot, one for a caged passenger and two to float around outside the ship. Two pieces of wire are provided for the floating figures so they can be posed proud of the taxi. On the side of the ship is a large cargo door that can be posed open. Don't worry about snuffing the pilot by having the door open as he is in a separate pressurized compartment. Clear parts are provided for the portholes, the pilot's cover and the lower display stand. The stand itself is a model of the earth, though if the perspective is correct, the taxi would be orbiting the moon! Nonetheless, it is very well done and a short ball pivot is provided to mount your space ship. The instructions are quite typical of these older kits with photographs showing the various construction steps. There is an exploded view of the entire model given as well. Painting information is in a small section of the instructions with colors given in generic terms as was the norm. Decals are for a single 'US Space Force' vehicle. These decals are very glossy and it is quite problematic if they will be any good at all. You may be better off to rummage for stuff from your spare decal box (you do have one, don't you?). If these older space kits is your passion, you can find this for a LOT less than the collectors will want for an original issue. Not only that, it looks as if it will be a pretty easy build and it is sure to be a lot different from the usual models on your shelf.